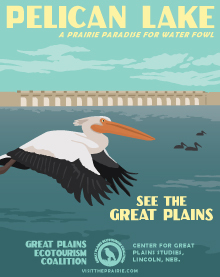 Locals and visitors welcome the arrival of the American White Pelicans with an annual homecoming celebration at the Harlan County Reservoir in south-central Nebraska. 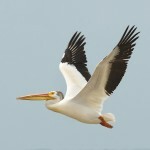 The white pelican is one of the largest birds in North America. They use a special pouch in their bill to scoop fish. Their breeding grounds are in the Northern Great Plains states and into Canada. They can be seen migrating in the lower Great Plains states. The Chicken Dance Trail provides opportunities to see not just prairie chickens, but a multitude of other bird species in south central and southwestern Nebraska. The Chicken Dance Trail is not a physical location, but a website full of insider information about canyons, reservoirs, and creeks where you’re sure to spot the birds on your bucket list — as well as rural communities to explore along the way. The Chicken Dance Trail organizes the information into five birdwatching trails that travelers can take independently, at their own pace. Harlan County Lake, Nebraska’s second largest lake, is a U.S. Army Corps of Engineers project. The lake is a favorite for camping, boating and water skiing. Harlan County Lake is open year round, with public access on all of the Corps property for hunting pheasants, quail, turkey, deer, ducks and geese. During the winter, when the lake is full of tens of thousands of ducks and geese, American Bald Eagles can be viewed at the Alma end of the lake or from the dam. 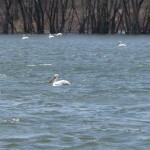 Harlan County residents know that spring has finally arrived when white Pelicans take up residence at the lake..